For decades, the Christian Right's high-profile clashes with science have made national headlines. From attempts to insert intelligent design creationism into public schools to climate change denial, efforts to "cure" gay people through conversion therapy, and opposition to stem cell research, the Christian Right has battled against science. How did this hostility begin and, more importantly, why has it endured? Antony Alumkal provides a comprehensive background on the war on science--how it developed and why it will continue to endure. 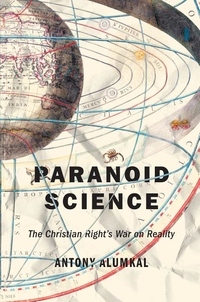 Drawing upon Richard Hofstadter's influential 1965 essay "The Paranoid Style in American Politics," Antony Alumkal argues that the Christian Right adopts a similar paranoid style in their approach to science. Alumkal demonstrates that Christian Right leaders see conspiracies within the scientific establishment, with scientists not only peddling fraudulent information, but actively concealing their true motives from the American public and threatening to destroy the moral foundation of society. By rejecting science, Christian Right leaders create their own alternative reality, one that does not challenge their literal reading of the Bible. While Alumkal recognizes the many evangelicals who oppose the Christian Right's agenda, he also highlights the consequences of the war on reality--both for the evangelical community and the broader American public. A compelling glimpse into the heart of the Christian Right's anti-science agenda, Paranoid Science is a must-read for those who hope to understand the Christian Right's battle against science, and for the scientists and educators who wish to stop it.